Homemade Tandoori Masala is an authentic Indian curry masala. Homemade Tandoori Masala is very versatile spice mixture. Homemade Tandoori Masala can be used with any veggies, paneer, tofu or your non-veg dishes. Homemade Tandoori Masala gives you a perfect dhaba style tandoori smoky flavor, even you can call it Indian BBQ spice mix perfect for BBQ grilling with authentic taste. Moreover, this tandoori masala is easily available in any Indian grocery store under spices like garam masala, chole masala, pav bhaji masala but homemade also as that easy and it give you the organic and preservative free satisfaction. Indian cuisine is characterized by the use of various spices, herbs and other vegetables in India and also for the widespread practice of vegetarianism across many sections of its society. Each family of Indian cuisine is characterized by a wide assortment of dishes and cooking techniques. As a consequence, it varies from region to region, reflecting the varied demographics of the ethnically diverse Indian subcontinent. Same like tandoor also part of Indian cooking tandoor means clay oven mostly using for Indian breads like naan, Kulcha, and some other oven baked flat breads! But this tandoor not only use for breads but also using for grilling spice marinated veggies too! It called tandoori spiced veggie! Homemade Tandoori Masala is a mixture of spices specifically for use with a tandoor, or clay oven, in traditional north Indian and Pakistani cooking. 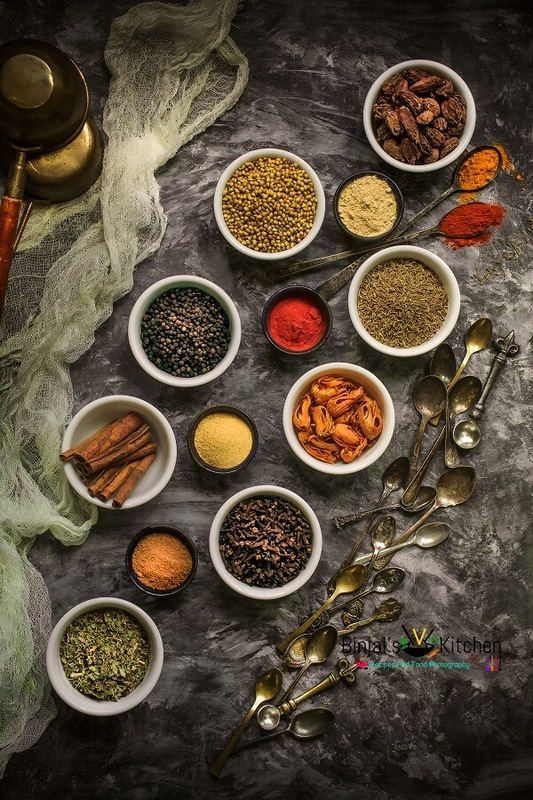 The specific spices vary somewhat from one region to another, but typically include Whole spices, garlic, ginger, pepper, and may include other spices and additives. The spices are often ground together with a pestle and mortar or spices blender. Tandoori Masala is used extensively with dishes as tandoori paneer tikka. In this dish, the paneer and veggies are covered with a mixture of plain yogurt and tandoori masala. The it is then roasted in the tandoor at very high heat. Other Indian dishes, in addition to tandoori paneer, use this masala, such as tikka or tandoori veggies, veg and non-veg most of them Punjabi dishes. If freshly prepared, the masala can be stored in airtight jars for up to two months. The spice blend is also readily available at larger supermarkets and specialty Asian stores, with varying tastes depending on the brand. 1. Break the cinnamon stick into 2-3 parts and then heat the pan on medium flame. Add all whole dry ingredients like coriander seeds, cumin seeds, black pepper, clove, broken cinnamon stick and mace. 2. Then roast all whole ingredients for 3-4 minutes on low flame. 3. Remove it into the plate and cool it down completely. 4. Once cool down add into the coffee blender or spice blender and blend it till it becomes fine powder. you need powerful blender to blend all these dry ingredients. 6. Now sieve the blended mixture thru fine sieve. If there is some coarse mixture remain after sieve, then blend it again and follow the same process. 7. Homemade Tandoori Masala is ready for use. • Store the blended powder into the airtight jar upto 1-2 month and use it when required. • Add salt as per your choice. • If you don’t like little sweet taste, then skip the sugar. Break the cinnamon stick into 2-3 parts and then heat the pan on medium flame. Add all whole dry ingredients like coriander seeds, cumin seeds, black pepper, clove, broken cinnamon stick and mace. Then roast all whole ingredients for 3-4 minutes on low flame. Remove it into the plate and cool it down completely. Once cool down add into the coffee blender or spice blender and blend it till it becomes fine powder. you need powerful blender to blend all these dry ingredients. Add remaining powder ingredients into the blended mixture and blend it again till mix it properly. Now sieve the blended mixture thru fine sieve. If there is some coarse mixture remain after sieve, then blend it again and follow the same process. Homemade Tandoori Masala is ready for use. Awesome is the word. I love your photography style Binjal. Wish I could capture like you. Where did you get those spoons from? Very impressive. Simply awesome is the word. I adore your photography skills Binjal. Wish I could become like you one day. I am totally impressed with those spoons. Where did you get those dear? Enjoying your photographs as much as I do your recipes ! Gorgeous pictures Binjal! And love the recipe! 😍😍 from now on, I’ll use this instead of the store bought one! Thank you so much for sharing!